Oreck Corporation was founded in 1963 in New York City. When it started there was only one product for sale, an upright vacuum cleaner. They begin making vacuums cleaners in 1979. It still makes vacuums in the United States. Their main facility is in Cookeville, Tennessee. Oreck found success selling lightweight upright vacuum cleaners. It was looked down upon by other companies because the vacuums were considered too light to be a real vacuum. They referred to them as "toys." These lightweight vacuums were marketed to hotels. The vacuum quickly became a favorite of housekeepers. It was light weight and powerful enough to clean well. Today more than 50,000 hotels use Oreck vacuum cleaners. After proving the vacuum cleaners worked well, the company began marketing the vacuum cleaners to the general public. Their slogan was these vacuums were a "hotel vacuum for the home." Oreck sold vacuums through mail order and radio commercials. The vacuums proved popular and they rapidly expanded. It now sells canister and handheld vacuums, air purifiers, and other floor cleaning machines. It began as a family business and it remains a family business. David Oreck began the company. Today his son, Tom, has served as President, CEO, a member of the Board of Directors, and Chairman of the Board. This company continues to grow today. It sells its products worldwide. It sells products in North and South America, Europe, and Asia. 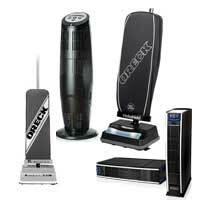 Oreck is a leader in manufacturing home cleaning equipment. Without a doubt they make excellent vacuum cleaners. They have a good reputation for using quality materials and producing durable products.